We finally made it. 2017's last hours are upon us, and a lot happened this year. While many sites are doing a "best of" list or some other review of their years, HBIC is not doing that. I rolled over 3800 blog posts this week, and I really think that the decade that I've put in on this blog has seen me experience just about every emotion that one can exude. Officially, I won't finish Year Ten until mid-January, but tonight is all about reflection in terms of where this blog came from, where it sits currently, and where it's going. I'm not stopping the insanity, but I think it's time I evaluate where I am after a decade. I've already switched my phone off for the night. I don't really want to be bothered by social media tonight. Instead, I'm going to enjoy a quiet night at home while I take in a couple of movies along side a bowl of popcorn and some of that exquisite Irish Cream whose recipe I posted a week-or-so ago. People will question my choosing to stay in tonight, but New Year's Eve isn't my thing any longer so I'll leave it to the younger generations to fill that void. I just want to click through a few articles quietly and read some of the work I did over the years to figure out where this blog will go in the future. When I need a break, that reading will be broken up by a few Hollywood blockbusters. In terms of hockey-related news, Canada won the Spengler Cup for the third consecutive year today with a 3-0 win over the Swiss national team, Winnipeg thumped Edmonton 4-0 as the Jets moved back into first-place in the Central Division, and Canada will play Switzerland in the quarterfinals at the World Junior Championship. Hockey! If you do go out tonight and imbibe to celebrate the new year's arrival, please get yourself a driver and get home safe. Be safe, readers, and make sure you're looking out for one another so we can cheer our teams, boo other teams, laugh about some of the funny moments, and lament decisions made by general managers in 2018. You're all important parts of this blog, and I thank you for reading and dealing with my insanity in written form! In saying that, let's make 2018 just as awesome as the last ten years! Until next time, see you next year! You're always told as a player that you're playing for the name on the front of the jersey, not the name on the back. It seems that Finnish defenceman Kasper Kotkansalo is taking that to a whole new level by donning a jersey without his name! Before anyone goes overboard with conspiracy theories or secret player ideas, Kotkansalo has a perfectly valid reason for playing nameless: his blood. The only exception to Rule 40-xi [Teebz: 40-xi states a player cannot change sweater numbers once the game is started] is if a player's sweater becomes stained with blood or becomes badly torn during game. At that point, he may be told by an on-ice official to leave the ice and change into a designated sweater with another number and no nameplate. Kotkansalo has been wearing #36 at this tournament, but the officials made him change to another number sans nameplate after they invoked the blood rule due to his jersey showing more red than normal. Kotkansalo finished the game against the Slovaks wearing #24. He didn't factor into the scoring, but Kotkansalo's play should be noted. The Red Wings' draft pick pulled the puck off the goal line in the first period to keep the game scoreless, and then rang a laser of a shot off the goal post at the other end of the ice. 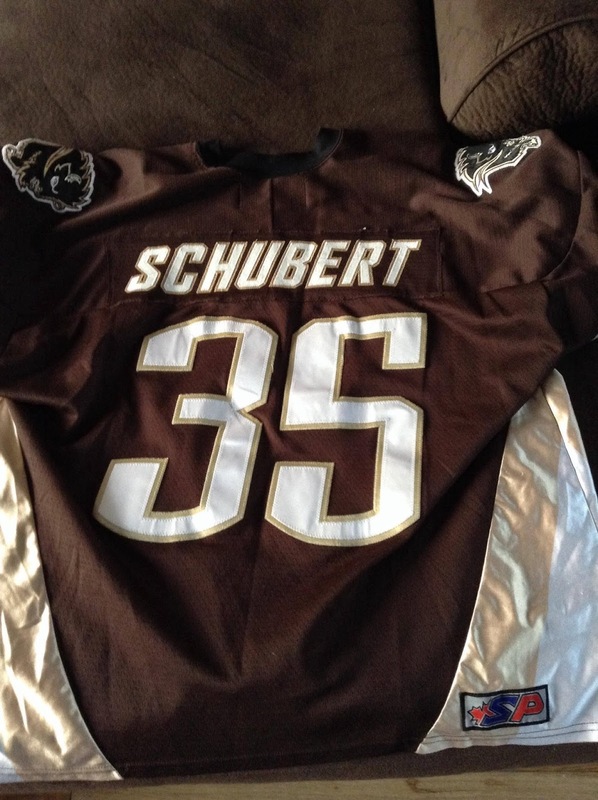 He did that while wearing #36, so it seems he should try and get that jersey cleaned as soon as possible. If you were wondering, Finland did hold on to down Slovakia by a 5-2 score. The Slovaks now need to defeat Denmark tomorrow to avoid relegation while Finland sits in second-place in their pool between Canada and the US for the time being with an all-important date with the Americans looming tomorrow evening. The medal round match-ups will be determined tomorrow, so tune in to your local World Junior Championship network! I can already hear people saying it: Teebz is a sore loser. I thought today's game between the US and Canada at New Era Field was absolute trash. The game, when it was played, was a decent show of talent between the Canadian and American players, but it's time for this gimmick to stop when there are important games on the line. Granted, Canada did get an all-important point out of the shootout, but this is a game that should have been played indoors. If the road to hell was paved with good intentions, the planning for this game had all the right intentions when it was announced. As the Canadians and Americans practiced yesterday, it was noted that "chunks" of ice were breaking off the ice surface as the players dug in with their skates. The weather forecast, which had the day predicted as -8C and sunny early in the day, is now looking cloudy and snowy with a high in the mid-minus-teens. This might have been hockey weather on the ponds back in the 1950s and 1960s, but it's not the kind of weather one wants for a high stakes game at the World Junior Championship. Rather than giving in to sensibility, the organizers pushed ahead with the game today, and we got to watch hockey in a snowstorm as the ice crew got more TV time than some of the players did. Some will say that the organizers can't control Mother Nature, and I agree with that. Where the organizers do have control, though, is by heeding the forecasts that meteorologists give when it comes to Mother Nature's effect on these games. The snow was coming, and it made for a gong show of a game. The other thing about these games I despise are the stoppages in the third and overtime periods to allow teams to switch ends. Again, no other game has this "feature" which makes it, at best, an inconvenience and, at worst, a momentum-killing break in the action. It's an awful feature, and that's why these games need to be retired here and now so we don't see them happen in Vancouver and Victoria next season. As an aside, what was happening with TSN's broadcast position at this game? It looked like they were filming the game from the concourse rather than in a position where the play was easily seen. As the broadcast rights holder, that only irritated me more as I watched this debacle unfold. But I digress. These types of games were unique when they happened once per year, became a spectacle and circus when they moved to six times a year, and are now passé when it comes to their attraction. Sure, everyone says it's fun, but when you can't see the puck and have no idea who is on the ice because you're a million miles away on your seat, these types of games need to move to a better venue or be disposed of entirely. Congratulations to Team USA who battled through the snow and stoppages to find a way to erase two two-goal deficits and earn two points via the shootout in a 4-3 win. Casey Middlestadt was absolutely deserving of his Player of the Game award as he took his play to another level. Unfortunately, he had to do it in an environment that limited the play of most other players. Enough with the gimmicks. It's over. The Hockey Show, Canada's only campus-produced radio show that strictly talks hockey, is back tonight with a deeper look at the two tournaments running simultaneously this week! The World Junior Championship is currently on every TSN channel you may have as it takes place in Buffalo, New York while the Spengler Cup sneaks its way into TSN's programming when it can as it is being held in Davos, Switzerland. There have been some notable performances at the World Junior Championship thus far, but the one group of people that has yet to show up are the people of Buffalo. We'll also take a look at the changes that happened in Davos for this year's Spengler Cup as The Hockey Show dives deep into the Swiss-based tournament! It's just Teebz in the booth tonight as the lone wolf will pick apart the World Junior Championship! The image to the left is a pretty accurate look at the fans in Buffalo at this year's World Junior tournament. 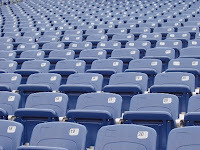 Buffalo has seen horrible attendance numbers for the first five games that were played in the 19,200-seat Key Bank Center, and it might be time for the IIHF to really sit down and examine the issues surrounding the dwindling attendance figures seen in Montreal and Buffalo over the last two tournaments. I'll take a shot at how to fix this tournament so more people show up, and I'll even float a crazy idea out there to rekindle the spark in this tournament. I'll dig into the changes at the Spengler Cup. I'll have some news and notes about a few other Euro hockey teams and players, and I'll end the show tonight by giving my regards to one of the classiest men to ever play the game in Johnny Bower. This all happens tonight at 5:30pm! Ok, so how do I check this show out, you ask? We suggest that you download the UMFM app on your phone or tablet. It's the easiest and most convenient way to listen to any of UMFM's great shows any time of the day, so go get it! Just follow this link on your iDevice or this link for your Android device and get the UMFM app! It's never been easier to tune into The Hockey Show or UMFM! Download the UMFM app today, and don't miss any of our great programming or shows! Of course, you can do the radio thing at 101.5 on the FM dial and you can always listen online via the UMFM website! If you prefer social media, we try to remain up-to-speed there as well! Email all show questions and comments to hockeyshow@umfm.com! Tweet me anytime with questions you may have by hitting me up at @TeebzHBIC on Twitter. You can also post some stuff to Facebook if you use the "Like" feature, and I always have crazy stuff posted there that doesn't make it to the blog or show. Tonight, Teebz rips into the World Junior Championship, explores the Spengler Cup and its entrants, updates some European hockey news, and bids farewell to the classy Johnny Bower on The Hockey Show found only on 101.5 UMFM and on the UMFM app! After having a few days off in a row, it's always tough to get back into the swing of things at work. 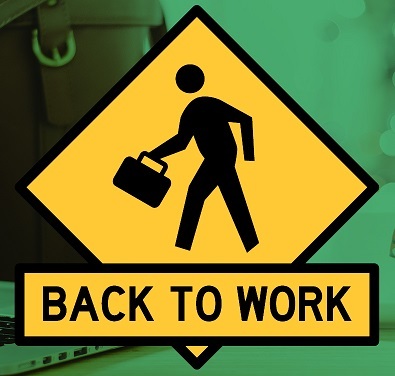 The NHL will pick up where it left off, the World Junior Championship will continue, the Spengler Cup in Davos, Switzerland presses on, and we're looking at another long weekend with New Year's Day falling next Monday. These two weeks are making it hard for me to keep my regular sleep pattern thanks to all this hockey to consume! Luckily, I'm only here today to discuss one tournament: the Spengler Cup. Canada won't play today after defeating Mountfield HK yesterday, but this year's edition of the Spengler Cup is a special tournament! It's not often that the Spengler Cup features a potential Olympic team, but we're getting that with Canada this year after the NHL decided not to allow its players to participate. Even rarer this year, we'll see a second potential Olympic team at the tournament as the Swiss national team will enter a squad as it evaluates its potential players for the upcoming Pyeongchang Olympic Games! There won't be enough NHL players or former NHL players to even form one line for the Swiss team, but there are a few names that people may recognize. The first is defenceman Raphael Diaz who played for the Canadiens, Rangers, and Canucks, and currently suits up for EV Zug. The other is Damien Brunner, the former Devil and Red Wing, who now toils for HC Lugano. Outside of Diaz and Brunner, the name Tobias Stephan may jog some memories of his time with Dallas in the NHL and Iowa and Bridgeport in the AHL, but he's now tending nets with EV Zug. Aside from those names, the rest of the squad is virtually unheard of on the North American stage. That's not to say that they can't play, though, as we saw them easily handle the KHL's Dinamo Riga in the tournament's opening game. Players like Eric Blum, Luca Cunti, and Leonardo Genoni will be ones to keep an eye on as the Olympic tournament approaches as they will most likely be prominent players with the Swiss team. Canada won't see the Swiss national team unless they meet in the medal round, so we don't get an Olympic preview in the preliminary round. However, if they do meet in the medal round, it will be an Olympic preview as Canada and Switzerland are scheduled to meet in an Olympic preliminary game on February 15, 2018. Could we get an idea of how each of these teams may do at the Olympics? We'll have to see how both 1-0 teams finish this tournament. It's been a tough day to find motivation to work after a nice break, but there's a ton of hockey to be played and I'm going to stay on top of it. I'll talk more about this tournament tomorrow, but the Olympics teams are two-for-two at the Spengler Cup! It's always a sad day when one of the genuinely nicest people representing a team or sport passes away. Today, on Boxing Day, we lost Toronto Maple Leafs netminder Johnny Bower at the age of 93, and there may not have been a more likable Maple Leaf in the history of that team. He was born November 8, 1924 in Prince Albert, Saskatchewan, the son of Ukrainian parents in Johnny and Betty Kiszkan and the brother to eight sisters. It wasn't until his parents divorced in 1946 that he adopted the name "Bower", his mother's maiden name, and began to catch the eye of hockey scouts. He wasn't always a Maple Leaf, though, as he spent considerable time in the AHL and was a small note in the history of the New York Rangers. Not bad for a kid who made his own goalie pads out of an old mattress and used a tree branch for a stick on the ponds of Prince Albert! I never had the pleasure of meeting Johnny Bower in my travels with hockey, but he seems like the kind of guy that you'd enjoy chatting with thanks to his extensive involvement in the game. Bower, who made his Maple Leafs debut at the age of 34(!) 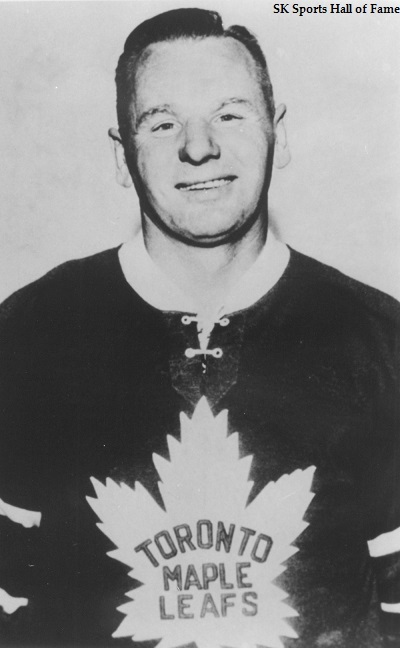 in 1958-59, went on to play twelve seasons with Toronto's team. Prior to that, he spent time with the New York Rangers before becoming a fixture in the AHL with Providence, Vancouver, and Cleveland. Bower was outstanding in the American League where he played a total of thirteen seasons, winning the Calder Cup three times, the Hap Holmes Memorial Trophy three times for having the lowest goals-against average, was the first goalie to named as the AHL's Most Valuable Player in 1956, and he'd be named MVP two additional times after winning his first award. On top of all that, Johnny Bower is still the AHL career leader in wins with 250 wins in 552 AHL games. It should be noted that his time in New York wasn't without recognition. In 1953, Bower was awarded the Frank Boucher Trophy, given to a New York Rangers player that is regarded as "the most popular player on and off the ice". Bower played 70 of his 77 total games as a Ranger in 1953-54 at the age of 27, and his career numbers as a Ranger showed a 2.73 GAA and five shutouts on a 31-35-11 record. With the younger Worsley keeping Bower from playing full-time, it's pretty clear why the Rangers made him available in the 1958 Inter-League Draft. All of this information above, however, can be found by combing through the internet's various websites dedicated to hockey. I wanted to find proof of just how great of an individual that Johnny Bower was. One such clip is with Lindsay Dunn from January 2017. While he shows he still has the pipes at age 92 in that clip, his outgoing personality and exuberance in the clip can't not be noticed. In a clip from CBC's The National, you can see just how proud he is of his hockey legacy while still letting that friendly, playful demeanor shine. The China Wall, named because of his wall-like play during the four Stanley Cup-dynasty he backstopped in Toronto, was also an innovator as he was the first goaltender to start using the poke-check as a tool in his arsenal of goaltending techniques. Here he is teaching the poke-check, and he's the kind of teacher I think we'd all like to have! Johnny Bower truly was an icon in the hockey world. He often came across as a wise and kind grandfather rather than one of the most famous men to ever wear the Maple Leaf, and that's entirely why he'll be missed. He's a Hockey Hall of Fame inductee, a Cleveland Hall of Fame inductee, a Rhode Island Hall of Fame inductee, and a Saskatchewan Hall of Fame inductee. He will be missed because of all the lives he touched in his 93 years of life. Rest in peace, Mr. Bower, and my thoughts are with the Bower family tonight. It always makes me laugh when leagues that are struggling to make a footprint outside of their immediate markets decide it's a good idea to block those on social media who promote them in non-immediate markets. The CWHL apparently took some sort of offence to me asking them legitimate questions about the Vanke Rays' problematic statistics when it comes to Chinese-born players. The end result? They'll no longer talk to me. It all started after Vanke's 12th game of the season where Vanke defeated Boston 5-1. Vanke finally got a goal from a Chinese-born player as Xin Fang scored at 9:46 of the second period on power-play to make it 4-1. She would also add the fifth goal - her second of the night and on the season - at 10:15 of the third period. Many went on social media and gushed about how great it was to see Fang become the first Chinese-born Vanke Ray score a goal. It is a huge accomplishment, and one of which Fang should be proud. It's something that will be written into the CWHL record books that no one can erase. However, let's take a quick flashback to June 6, shall we? "It is a very historic moment for Canadian women's hockey and for women's hockey across the world. The CWHL is extremely happy that we will be expanding to six teams and that sixth team will be in China. It's an opportunity to grow the game for women, which is important for all of us," Canadian Women's Hockey League Commissioner Brenda Andress told the IIHF's Martin Merk. It took the collective twelve Chinese-born players on the Vanke roster twelve games to dent the twine. Only one of those twelve players has a goal to speak of, and only three Chinese-born players have points. In contrast, the top six scorers on Vanke - Cayley Mercer, Ashley Brykaliuk, Hanna Bunton, Brooke Webster, Emma Woods, and Emily Janiga - have scored a collective 45 goals through 13 games while the Chinese-born players have scored just two. Or, to put that in percentages, the six North American-born players have scored 95.7% of all of Vanke's goals. To make matters worse, the North Americans have amassed 96.1% of all the points - goals plus assists - scored by Vanke players to date. Explain to me how having six North Americans score 45 of 47 total goals and 100 of 104 total points on a roster that features twelve Chinese-born players is "growing the game" because I'm not seeing it with the Vanke Rays. And because no one can explain that, I did what any self-respecting inquiring mind would do: I went to the source for answers. @TheCWHL Can you tell me why you're not tracking TOI for players other than goalies? I'd like to see the TOI info for the two Chinese-based teams to see if your "grow the game" sentiment is really honest. Based on stats alone, it seems the foreign-born players play a lot more. @TheCWHL And don't ignore the above tweet. You have an obligation to fulfill your "grow the game" promises in China which I find to be lacking based on the fact that Vanke scored 42 times before a Chinese-born player scored. That's almost inconceivable based on roster design. Of course, I received no answers. I honestly didn't expect an answer because that would be an admission from the league that these numbers were a little out of whack, but I was hopeful someone would at least drop a prepared statement about working with the Chinese Hockey Federation to improve the abilities of the Chinese-born players, leading to better results in the future... or something like that. But the radio silence from the league was damning if nothing else. The Rays are now thirteen games into the league, and Elaine Chuli has played every second of every game this season for the Vanke Rays. Even against the lowly Boston Blades - who are 0-13-0-2! - Chuli has gotten the call in all four games. There is absolutely no reason why Tianyi Zhang should be forced to sit for all thirteen games if the league is truly trying to grow the game. @TheCWHL Make it 13 games where Chuli starts and plays every second of the game for Vanke. Total points scored by a Chinese-born player in Game #13? Zero. Four points for an entire Chinese-born roster in 13 games. The optics on this are ridiculously bad. What say you? Look, I get that these tweets have an accusatory tone to them. They're supposed to be accusatory since one of the league's reasons about going into China was to help the Chinese Hockey Federation improve their players and to "grow the game". As I tweeted above, the optics are ridiculous when one looks at the Vanke Rays' stats sheet, and I'm starting to believe that while the league may have had good intentions to grow the game, the results are entirely different. So what does the league do in response to my critical tweets? They block me on Twitter. And while I get that it's within their right to do so, I question this line of thought considering the promotion I do for the league in my non-traditional market. I talk about and promote the league via my radio show, this blog, and over social media, but to start blocking me over a couple of critical tweets is extremely thin-skinned. Yes, I said it. No, I'm not sorry. It's not like I pointed something out that was confidential or took place behind-the-scenes. I watched a few games. I literally went to the stats page and did a couple of quick calculations. I paid attention to what was said in June and what's happening on the ice in December. In the end, I concluded that things simply don't add up. Maybe I'm way off here. Maybe my conclusions are entirely wrong based on the statistical and visual evidence I collected. Maybe there's more going on that I'm not aware of when it comes to teaching the Chinese players how to play hockey at a high level. I'd like to believe that, but I don't see it based on the evidence I have. If you know differently than what I've seen and calculated, please point out my mistakes. I'd love to be smarter about what's happening in China. You know what could have alleviated those concerns fairly quickly? A response to my tweets. As a result of the CWHL's actions over this last week, I am making this pledge here and now for all my readers. I will never again write about the league on this blog. I will never again speak of the league on my radio show. I will never again make any mention of the league on social media. The CWHL, for all intents and purposes, no longer exists. I will still support the players who play in the league, but there will be no mention of the league's name nor it's abbreviation when speaking or writing about the players. For all the promotion I gave this league without ever asking for anything in return, that ship has now sailed because the CWHL doesn't have the common decency to reply to a tweet. The worst thing about being talked about? Not being talked about. Merry Christmas, CWHL. You earned a pile of silent nights from me. With the big day a mere few hours away, I took the day off. I'll spend tomorrow morning with family as we open gifts and enjoy a breakfast/brunch setting before we all break away and do our own things in the afternoon and evening. No dinner, you exclaim? That's correct: no one really wanted to take on that endeavor, so we decided the brunch idea would be best. This post is less about hockey and more about remembering what's important. Hug friends and family. Wish them the best. Be less concerned with what you get and more concerned with who is giving. Family, friends, and loved ones are the most important people over the next few days, so make sure you show your love and appreciation to those that matter most. Gifts are nice, but being grateful for the people who give them is a far better way to live. Take care, everyone, and all the best to you and yours this season! Until next time, Merry Christmas! 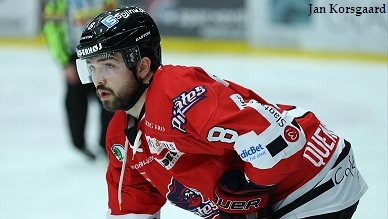 If there was one thing that the Aalborg Pirates had last season, it was a clutch scorer in Peter Quenneville. That's not to say that they haven't been getting solid contributions from the lineup this season, but it was announced on Thursday that Quenneville had rejoined the Metal Ligaen team after stints with Czech HC Dynamo Pardubice and Finnish SaiPa. Getting a proven goal machine like Quenneville back will be crucial to the Pirates' success in the second-half of the Metal Ligaen season! Quenneville finished the season last year having scored 30 goals and 19 assists in 45 games, and he was especially lethal on the power-play. His 30 goals were more than double that of Aalborg's second-highest goal-scorer Martin Hojbjerg from last season. This season, Hojbjerg leads the Pirates in goal-scoring, but expect Quenneville to come in and add the second-half of the one-two punch that Aalborg featured last season. "We know Peter, and we know what we get in him, and he knows what we expect from him," sports director Ronny Larsen told hockeymagasinet.dk. "We get a player into the team who is hungry for success, which should not be underestimated in ice hockey. Peter possesses a good and accurate shot that can be used both in the 5-on-5 game, but especially in the overall, where it gives us more options." His season in Aalborg last season was his best as a professional in terms of points when looking at his ECHL, Czech League, and Finnish League stats. If he can find the chemistry with the Pirates he had last season, the third-place Pirates will have added another layer to their improving scoring on which they can rely. His 30 goals in 2016-17 represents the highest total Quenneville has posted in any season since he lit the lamp 33 times with Dubuque of the USHL in 2012-13. The excitement of getting Peter back on the roster was not lost on Pirates CEO Thomas Bjuring, and he used the opportunity to thank sponsors in helping make this addition happen. "It's a Christmas present in its clearest sense," Bjuring told hockeymagasinet.dk. "We have had the same offensive success, and therefore it is natural that we've been looking for reinforcements. No matter how much [the addition of Quenneville] makes sense, our budget has been used for the current season. That a group of good and loyal sponsors has increased our budget to pick up Pete is truly a Christmas present." We'll see how "Pistol Pete" settles in with this younger Aalborg team, but I suspect he'll find his groove quickly. The Metal Ligaen's fourth-leading scorer from last season will help the Pirates in their post-Christmas push, and that's good news for this writer's favorite Danish club! There are a few unquestionable truths about me when it comes to hockey. I believe hard work trumps lazy talent in all cases. I believe that Al Iafrate's hardest shot would still a record today if today's players were forced to shoot with tree branches like he did. And I firmly believe in Hockey Canada's pursuit of excellence at all levels of play. Today, though, I find myself questioning the last truth in that I believe the process is flawed, and there was a serious omission made by the coaching staff and management of Canada's national women's team. I'll still cheer for Canada in Pyeongchang, but it's not going to be the same as it was in the past. Canada announced today that they will take 14 forwards, six defenders, and three goaltenders to South Korea for the 2018 Olympic Games. This is a puzzling decision in that if one defender is hurt, there isn't a true defender to replace her. Meaghan Mikkelson has already been struggling with injuries and has finally returned from her most recent setback, but is this an injury that can re-occur? If it is muscular or joint-related, is there a chance it could flare up with a tweak? There were definitely some locks on the blue line that weren't going to be released by Team Canada. Laura Fortino has been her reliable self on the back-end, playing well in her own zone, making good breakout passes, and skating with the puck well. Jocelyne Larocque and Lauriane Rougeau will both join Mikkelson and Fortino just as they did in 2014 while Brigette Lacquette became the first Indigenous women to make the Olympic squad after her impressive showing over the last few months. And that left three defenders for one spot: Halli Krzyzaniak, Renata Fast, and Micah Zandee-Hart. Zandee-Hart had the biggest hill to climb out of the three players named above, and she simply didn't show enough to change minds in the Hockey Canada braintrust. That left two players whose styles were noticeably different, but whose experience and play set them apart. In every televised game that I watched - all six versus the USA, in fact - Halli Krzyzaniak looked like the better defender. Yes, Renata Fast played a more offence-oriented game that Krzyzaniak did, but the overall game seen by Krzyzaniak in the four games she played was better than what Fast showed in her five games. In fact, Krzyzaniak and Fast tied in points - one assist - in their appearances despite Fast playing one more game, and Krzyzaniak was more disciplined in not taking any penalties against the Americans while Fast was whistled for two minor penalties. In closely-contested battles such as the Olympics, special teams can be the difference between gold and silver. If you need any reminder, the Canadians beat the Americans in Sochi in overtime while on the power-play. Don't get me wrong: this isn't an attack on Renata Fast. No, we're simply spitballing about the best seven Canadian female defenders this country has produced, and Fast is included in that discussion. Heck, Erin Ambrose would make it an eight-woman discussion. I'm not blaming Fast nor Krzyzaniak for the dilemma that was presented to Hockey Canada's coaches and management when it came to releasing one of them either. In a perfect world, Canada would be taking seven defenders, and both women would be headed to Pyeongchang. 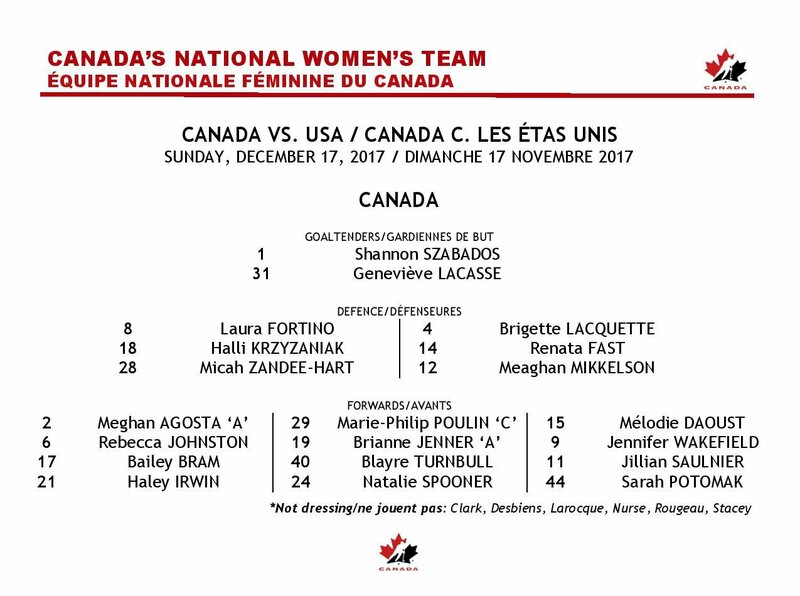 Melody Davidson and Laura Schuler certainly don't have to explain anything to me, but I'd like to know why they'd break from the traditional 13-7-3 setup to carry an extra forward when it's doubtful that Sarah Nurse, who played fairly well, will even see the ice as the 14th forward. 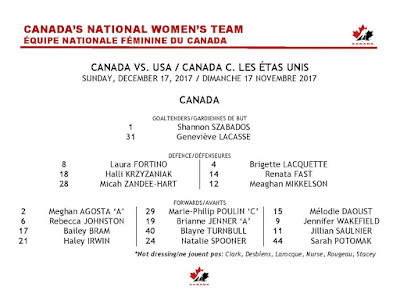 I don't know of any country's national team - men's or women's - aside from Canada's women's squad who has opted for 14 forwards and just six defenders. So why be different? Some have pointed to this moment as the answer. Yes, Krzyzaniak's shot from the point in the gold medal game of the 2017 World Championship was blocked, and it led to a three-on-two for the Americans which Hilary Knight buried to give Team USA the 3-2 win in overtime and the gold medal. Yes, that was a crushing defeat after Canada and the US had battled through sixty minutes to a stalemate, but this happened back in April! If Schuler or Davidson had any reservations about Krzyzaniak's abilities at that point, why wasn't she released then? Why keep her for so long and send Erin Ambrose home ahead of her if there was lingering questions from April? Over the next few months, Krzyzaniak put the work in to make sure she wouldn't be victimized like this again. She trained hard, watched video, and redesigned her game to make sure that she was a better defender than before, and it showed in the televised games between Canada and the US. She skated with the fast American forwards. She kept the bigger forwards such as Knight and Duggan from crashing the nets by using her strength. She took less shots, but moved the puck better and faster in all three zones in making better decisions. It seemed almost to be a perfect storm when Erin Ambrose was released by Team Canada earlier in the month. The opportunity to go 13-7-3 meant that only Zandee-Hart and a couple of forwards would needed to be released. 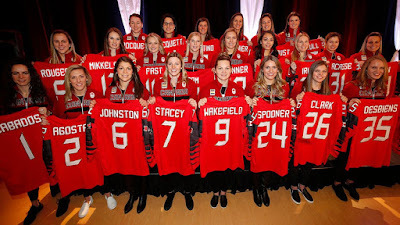 Sarah Potomak was almost certainly going to be one of them, so the tough decision would have been which of Laura Stacey, Bailey Bram, Emily Clark, and Sarah Nurse would be sent home. 13 forwards means that on any injury Canada has a player ready to go up front. Seven defenders means that Canada can weather any issues of one of the defenders is injured. Instead, there will be questions as to Canada's defensive scheme and abilities if one of the six defenders goes down now, and that simply means that Canada gets weaker with a forward on the blue line. Of course, Canada would go out and win the gold medal and not suffer any injuries. No one will ever bring the topic up again, Schuler will be crowned a national hero, and we'll live in four more years of bliss. However, if Canada falters or has to play a forward on the blue line, there will be questions about why Schuler didn't take seven defenders. If Canada's defensive play causes them to take home a silver medal, there will be questions about Schuler's decision to leave a solid defender like Krzyzaniak at home when she was arguably better in her own zone than Fast. Winning erases all problems, so Canada's mandate is very simple in this trip to South Korea: win. There are no other options unless Schuler wants her decisions to be called into question. She earned a silver medal in Nagano in 1998. If Canada earns another silver medal in 2018, Laura Schuler might earn the moniker of "Silver Schuler". When one looks back at the composition of Team Canada, there are a lot of good players whose talents should make them the best team on the ice in South Korea. Ultimately, it will be how the roster is used and who is sent over the boards that will determine Canada's standing at the end of the tournament. I guess it doesn't feel right with Canada not making the "safe" choice. Mike Babcock in Sochi toyed with the idea of going 14-6-3 before settling on the 13-7-3 roster. Canada usually is fairly conservative with its hockey choices, relying on veterans and younger players with a myriad of international experience before injecting some new life into the lineup. The decisions made today feel very un-Canada-like, and I'm not sure I'm comfortable going into the biggest tournament with no parachute in case a defender gets hurt. With the roster decisions today, the pressure squarely is on you, Laura Schuler. Let's hope you don't need to pull that cord. The Hockey Show, Canada's only campus-produced radio show that strictly talks hockey, is back tonight to "toast" the holiday season! Beans and I will have guests join us as we doing a little toasting of all sorts of things: bread, pastries, bagels, English muffins, and waffles! No, we're not going to be clinking champagne-filled glasses, but we will have coffee and breakfast items on-hand as we toast things with the Wayne Gretzky #GiveAToast toaster! It's all about breakfast and hockey in Finland as we have one, and possibly a second, special guest join us tonight for toast and coffee on The Hockey Show! Tonight, Beans and I are fortunate enough to welcome back one of our all-time favorite guests and a women who probably should be sitting in a co-host's chair had she not taken her goaltending game to Finland in Miss Amanda Schubert! Amanda has been playing for KJT over in Finland while adapting to life in her new country, and we'll talk to her about moving to a foreign country, playing net for a new team, learning the customs, language, and culture of Finland, and much more! If she's available, we may even get a drop-in visit from Finnish Olympian Venla Hovi as it may be the last time we speak to her before she leaves for Finland to centralize for the Finnish national women's squad that will compete in Pyeongchang! And all while this is happening, Beans and I will be toasting up Gretzky's face on various breakfast items for our guests and ourselves to enjoy! Expect images to hit social media of the various toasted food for your consumption as well! It's a busy show once again, but we're excited to have Amanda with us, possibly have Venla with us, and certainly excited to have Gretzky's face on all our food! If you prefer social media, we try to remain up-to-speed there as well! Email all show questions and comments to hockeyshow@umfm.com! Tweet me anytime with questions you may have by hitting me up at @TeebzHBIC on Twitter. You can also post some stuff to Facebook if you use the "Like" feature, and I always have crazy stuff posted there that doesn't make it to the blog or show. Yes, all of the Gretzky-toasted stuff will be on Facebook and Twitter! Tonight, we speak to Amanda about finishing school, becoming a Finnish transplant, playing Finnish hockey, and more and hopefully hear from Venla on finishing exams, goals for the Finnish national team, and her thought on the Bisons' finish to the first-half of the season while trying to finish off all our breakfast foods on The Hockey Show found only on 101.5 UMFM and on the UMFM app! I promised I'd post this recipe this week. 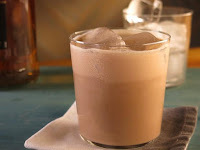 I'm going to say right now that my mom, who is not a drinker, will absolutely drink herself into a blackout if she was allowed with this recipe for Irish cream. Personally, the end result is so smooth and so easy to drink that you can easily over do it during the holiday season, so let that be a warning to those that make this: it's darn good! I was never a big Irish cream fan until good friend and overall great guy Paul Lukas of Uni-Watch and ESPN turned me onto the beverage by encouraging me to make it. It's a holiday tradition in both HBIC Headquarters and at my parental unit's homestead since he encouraged me to take the plunge, and I have a feeling it might become a tradition for a few more people if one is spirited - excuse the pun - to make it! I will say this upfront: sorry, Jessica Scott-Reid. It's not even close to being vegan with the cream required, but maybe you can figure out a way to adapt it? Your adaptations to normal recipes in using all vegan-friendly ingredients has been a refreshing way to change up my consumption habits! Let me know if you figure something out! Without further adieu, I bring you Paul Lukas' Irish Cream! Mix all ingredients in a large container and be sure to stir well. Refrigerate for a couple of hours, and enjoy over ice. * - any mid-range Irish whiskey will do - Bushmills, Jameson, Tullamore Dew - so don't buy any high-end whiskey. You'll lose the nuances of the high-end whiskey, which is what you're paying more for, in the Irish cream mixture. ** - whipping cream at 35% works best for a thick, smooth Irish cream. At the very lowest, don't stray below 18% or you'll lose the creaminess of the beverage. *** - an espresso shot is 1 tsp. of instant espresso in 2 tbsp. of hot water. You'll be able to taste the blend of chocolate, espresso, and vanilla tones in the smooth, sweetened base mixture of whiskey, cream, and condensed milk. It's such a great beverage for cooler winter evenings, and I guarantee people will ask you for the recipe. I can't say enough good things about this recipe, and I can admit to already making four full 750mL bottles for the next few weeks of holiday cheer. Thanks again, Paul, for the recipe, and here's to a little holiday cheer for all! Let's pretend for a second or two that it's February 2018. You're sitting in front of your TV watching the highlights from the men's hockey tournament happening at the 2018 Pyeongchang Olympics. Russia won big-time in their game. Finland performed well. Canada eked out a win. And that's when you do a double-take on the man wearing #1 and standing in the blue paint for South Korea. No, he's not Korean, and that's when it dawns on you that the curve of the blade on his goalie stick is facing inward rather than outward! Who is this masked man, you ask, and why does he hold his stick the wrong way? Who is playing net for Korea? That answer takes us to Clinton, Ontario where a young man tended nets in the Western Ontario Hockey League for the St. Marys Lincolns. 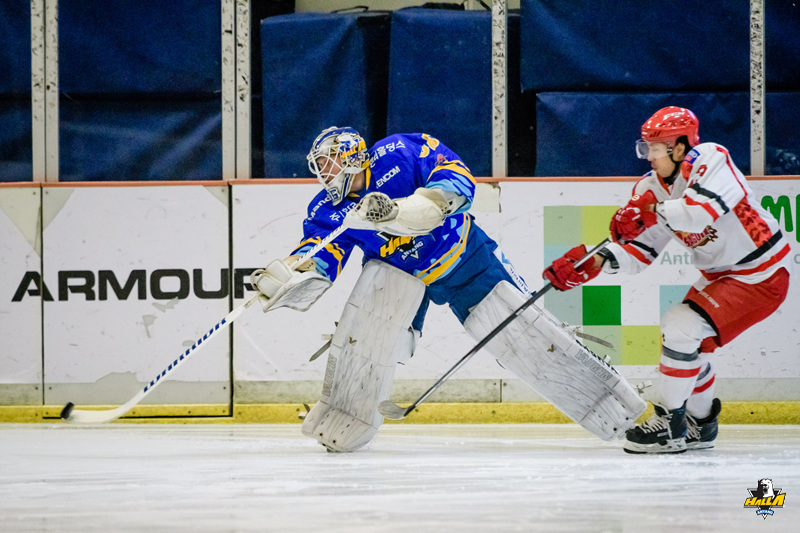 Matt Dalton's performance in that league landed him in the North American Hockey League for a season with the Bozeman Ice Dogs in Montana where he posted a 1.63 GAA and a .940 save percentage in helping the Ice Dogs go 48-9-1 to secure top-spot in the league. Dalton would be named the league's MVP and a first-team all-star after leading the NAHL in save percentage and setting the NAHL single-season records for goals-against average and save percentage. The Ice Dogs would fall in the final game of the Robertson Cup, however, as Dalton's season came up just short from capturing the NAHL's biggest prize. Dalton's performance didn't go unnoticed by scouts, though, and he was recruited to play hockey with the NCAA's Bemidji State University Beavers. 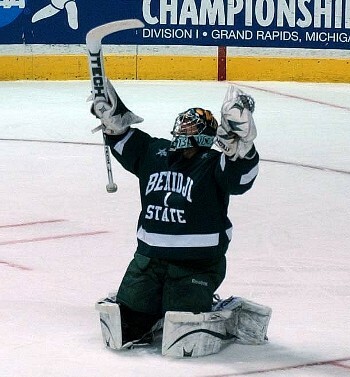 His first season saw him play in only five games, but his second season, at the age of 22, saw Dalton backstop Bemidji State through the Midwest Regional tournament as the fourth-seeded Beavers downed top-seed Notre Dame 5-1 and third-seed Cornell 4-1. At the Frozen Four in Washington, DC, the magic in Bemidji State's run ended in the semifinal at the hands of a two-goal, one-assist performance from Tommy Wingels as the University of Miami-Ohio downed Bemidji State 4-1. 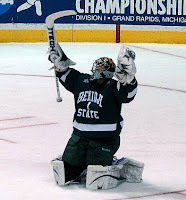 Dalton was named to the All-Midwest Regional Team for his efforts, and the undrafted goalie who wowed a number of NHL scouts was signed by the Boston Bruins on April 22, 2009. Dalton would spend six games with the AHL's Providence Bruins in 2009-10 before being sent to the ECHL's Reading Royals. Like he had done all his career, Dalton went into Reading and worked hard. It even earned him an emergency recall while Tim Thomas was at the Vancouver Olympics! He played in 46 games, going 22-20-4 with a 3.47 GAA and a .906 save percentage. It would be good enough to help the Royals make the playoffs as the seventh-place team in the American Conference despite finishing in second-place in the East Division. In the playoffs, though, Reading would catch fire as they dispatched Kalamazoo in five games, swept Florida in four-straight games, and narrowly lost in seven games to the eventual Kelly Cup Champion Cincinnati Cyclones in the American Conference Final. Dalton played all 16 games in the playoffs, posting a 3.02 GAA and a .914 save percentage. Dalton would again spend a cup-of-coffee period with Providence in 2010-11, appearing in 16 games, going 7-9-0 to push his AHL record to 7-13-1. He would spent the majority of the season with the Reading Royals again, but showed improvement in going 20-11-1 with a 2.86 GAA and a .919 save percentage. Reading finished second in the American Conference and first in the Atlantic Division, and they met Cincinnati in the opening round of the Kelly Cup Playoffs. They took the Cyclones out in four games before Kalamazoo swept Reading out of the playoffs. Dalton would only play seven games in these playoffs, and his stats took a serious hit as his GAA ballooned to 3.15 and his save percentage dropped to .902. Matt Dalton's time with the Bruins would come to an end that summer after Vityaz Chekhov of the KHL came calling. Dalton signed with the club, and he made his debut in the KHL on August 14, 2011 where he allowed one goal in a 3-1 victory over Metallurg Novokuznetsk. If there was one team that was memorable for all the wrong reasons in 2011-12 in the KHL, it was Vityaz. They were a collection of goons, and this goon squad brawled with Metallurg Magnitogorsk, Dinamo Riga, Avangard Omsk, and racked up the incidents and penalty minutes like they were going out of style. And on November 25, 2011, Matt Dalton would add his name to the list of brawlers on Vityaz when he engaged Michael Garnett of Traktor Chelyabinsk. Dalton is still wearing his Bruins mask, clearly seen at the 1:00 mark, but I'm not sure he earned the win in this fight when he already was half-undressed when he started swinging at Garnett. That's poor form. Anyhow, Dalton finished the season 7-21-4 with a 3.49 GAA and a .909 save percentage. Vityaz did not make the playoffs. In the summer of 2012, Dalton moved to a new KHL team when he signed with Nizhnekamsk Neftekhimik. 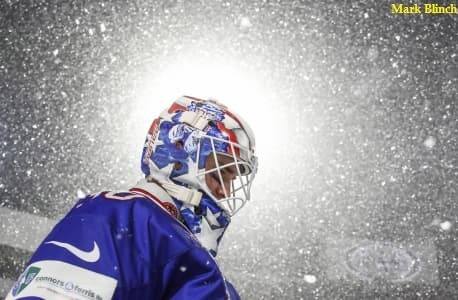 In 57 games with Neftekhimik over two seasons, Dalton went 18-27-7, posting a GAA of 2.64 and a save percentage of .917. Neftekhimik did play three playoff gamesin 2012-13, but they missed the playoffs in 2013-14. If Dalton was looking for a new opportunity, there was one coming on the horizon. In 2014, Dalton was offered a spot with South Korea's best Asia Ice Hockey League team in Anyang Halla. In pitching Dalton to come and play for Halla, the South Korean Hockey Federation had their sights on Dalton to backstop their national team in the 2018 Olympics. "It was kind of like that," Dalton told the IIHF's Martin Merk in 2016. "Obviously I had to go through a process to get my citizenship and nothing was guaranteed but it worked out and it's good. I love it in Korea. I love the everyday life there. It's very western-friendly, there's a big influence of Americans there. I've enjoyed it a lot." And that's how a kid from Clinton, Ontario became the starting netminder for the South Korean men's national hockey team! Pretty cool, right? Ok, so let's get back to him holding his stick with the blade facing inward. There's actually a fairly simple reason for it: he's a right-handed shooter! And now you have the full story on Mr. Matthew Dalton! Matt will be one of the goaltenders for the South Korean men's team at the 2018 Pyeongchang Olympics, so keep an eye out for that backwards stick. If anyone asks, you now know the story of the Canadian kid tending net for the Koreans and his funny stick! She was one of the greatest players to ever lace up the skates. She's both an IIHF Hall of Fame inductee and a Hockey Hall of Fame inductee. She's a three-time Olympian, twice winning a gold medal and once winning a silver medal. She is still Canada's all-time leading scorer at the IIHF Women's World Championship. She's a CIS National Champinship-winning coach with the Calgary Dinos, and she's still crafting young minds and hockey players today! She's one of the greatest female hockey players of all-time, and she's still giving back to the game. 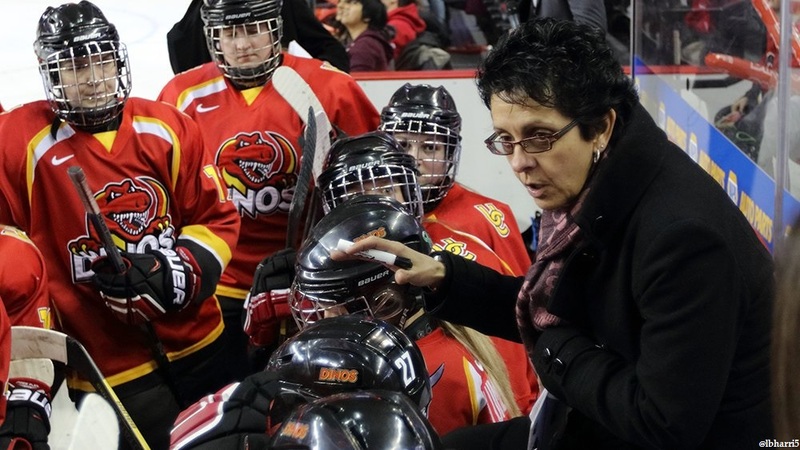 On last night's episode of Rogers Hometown Hockey, it was great to see another Canada West icon and program featured as Sportsnet spent a little time examining Danielle Goyette's career and legacy as she guides the University of Calgary Dinos as their head coach! It's nice to see players such as Paige Michalenko and Kira Makuk get a little exposure on the video, but Goyette's success with the Dinos has been an up-and-down experience. She had great success when Hayley Wickenheiser was leading the charge for the Dinos, but has seen leaner times recently after having her Russian Olympians - Iya Gavrilova and Sasha Vafina - graduate out of the program. In the last four seasons, the Dinos have compiled a 31-48-7-14 record. That includes a program-worst 4-19-1-4 record in the 2016-17 season, but hockey is cyclical when you have strong players graduate from the program. Calgary started slowly this season, but Goyette's squad is ferocious in the defensive zone this season as they've surrendered a conference-low 23 goals-against, and that effort has pushed them to a 6-8-1-1 record this season which has them positioned in a playoff spot at the moment. 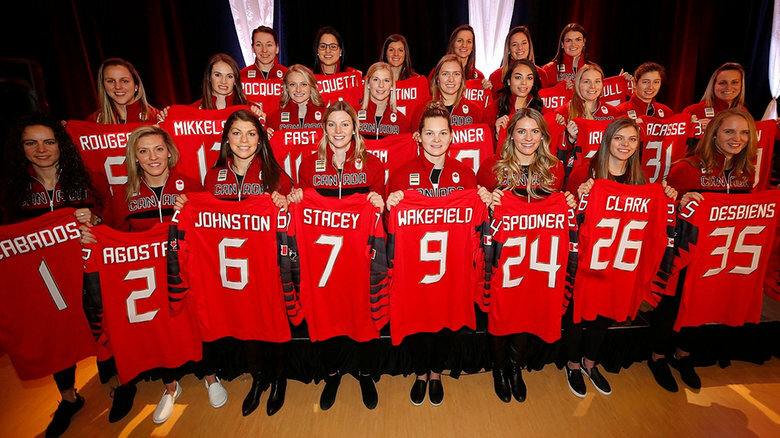 Goyette's name, legacy, and experience do attract players to the University of Calgary, but the Dinos are in one of the most competitive provinces when it comes to recruiting players as there are four Canada West teams in Alberta alone. Add in the fact that UBC, Regina, Saskatchewan, and Manitoba scout players from Alberta as well, and the Dinos really need some success to help their program move back into the upper echelon of the Canada West Conference. That being said, there are some standouts on the team who Goyette has certainly helped. Michalenko is one of those players as she has really developed into one of the steadiest defenders in Canada West. Forward Delaney Frey is a dangerous player whose scoring touch reminds me of Goyette's abilities. Goaltender Kelsey Roberts has been the big story as her efforts in terms of pitching shutouts have vaulted the Dinos up the Canada West standings. Let's not forget that this Dinos team shutout Regina in two consecutive games already, went 3-1 against the Lethbridge Pronghorns, and lost to both UBC and Alberta in one-goal games. There's a ton of fight in this Dinos team, and the Dinos have enough time and games left to push both the Regina Cougars and Saskatchewan Huskies for fifth- or even fourth-place, respectively, if they continue to play as well as they did before the break. And the mastermind behind the Dinos resurgence? None other than head coach Danielle Goyette whose team resembles the drive and determination of their head coach! I'm glad to see that her program and her career was highlighted this weekend! We're minutes away from the start of Game Six of the preliminary series between Canada and the US as both teams looks to finalize rosters prior to the 2018 Pyeongchang Olympics in February. There are still questions for each team that need to be answered regarding who will be going over to South Korea, and the recent slate of Canadian wins hasn't made any question easier to answer as both teams are getting contributions from all over their respective lineups. Tonight's game goes live in Edmonton, Alberta as the sixth and final game between these two foes at Rogers Place will decide all the unanswered questions! 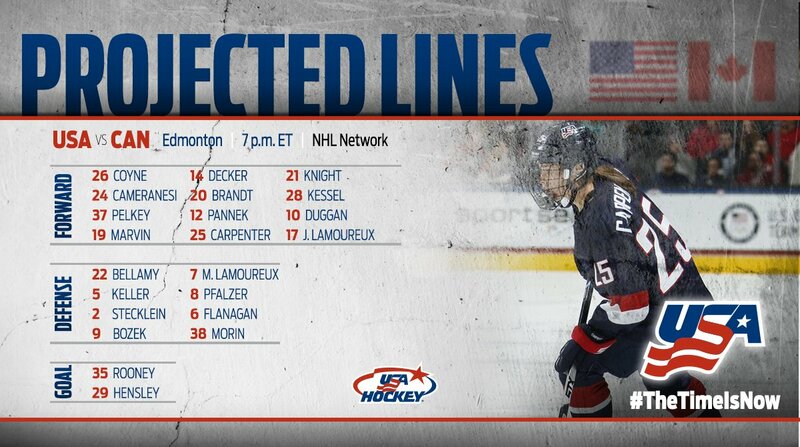 Directly from their governing bodies, here are Hockey Canada's and USA Hockey's lineups for tonight's game. With that, we're set for tonight's game as we'll pick this up with first period action! It seems we have Rod Black and Cheryl Pounder to call this one. Yikes. Shannon Szabados and Meaghan Mikkelson get the call in front of the Edmonton crowd. Both grew up in or in a suburb of Edmonton. Monique Lamoureux will shift back to defence for this game for the US. Does Robb Stauber own a razor? Canada's attention to detail seems a little off in the opening minute as a couple of miscues with the puck have already been seen. Will that continue? Excellent defensive play to break up a 3-on-1 by Monique Lamoureux. First good odd-player rush in the game just under five minutes into the opening period. Natalie Spooner's shot escapes the glove of Maddie Rooney and goes over the net! US catches a break seven minutes in. Maddie Rooney stops the puck, smothers it, and we have our first stoppage in action at the 12:05 mark. I'm liking that the officials are letting these two teams play! High shot by Jocelyne Lamoureux is gloved by Szabados at 10:21. With the stoppage at 8:32, this game feels like a chess match right now as both teams match lines and look for breakdowns in the defensive zone. Szabados with a good glove save on Bellamy at 6:52. Knight with good, strong play along the boards, but she needs to go to the net with the puck on that play. The sharp angle is too easy for Szabados to stop. Spooner rips a wrist shot wide from the slot at 5:50! Gigi Marvin is called for hooking at 4:49. 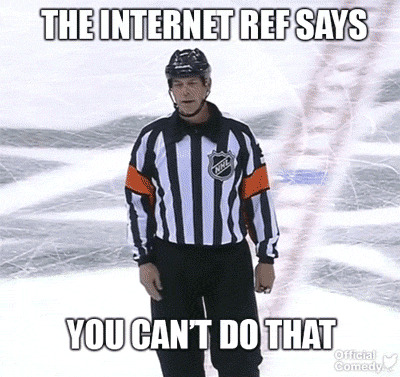 Canada to the power-play! Duggan takes a holding penalty, and we'll have a five-on-three for Canada! MARIE-PHILIP POULIN scores on the power-play with a slap shot from the top of the left circle at 2:44 just after the first penalty expires! CANADA LEADS 1-0! Canada with a dangerous icing with 16.3 seconds to play. Canada wins the draw, pins the puck along the boards, and time expires in the opening frame! Honestly, TSN's intermissions for women's hockey are pretty terrible. Officially, I've lost interest. I'm turning it over to the Jets-Blues game. Jets lead 2-0 over the Blues in the second intermission. Nick Boynton might be the worst color analyst in any sport. Back to TSN2 rather than listening to Boynton. Ugh. Micha Zandee-Hart upends Hannah Brandt, and Team USA will go to the power-play at 19:07. Scramble around the net, but somehow Szabados keeps it out of the net at 17:55! Penalty over, and Canada is back to even-strength! Rod Black informs the world that Natalie Spooner is playing with a broken finger. Thanks, Rod! Great strategy there! Icing called on the US at 15:11. Szabados makes what looks to be an easy save on Cameranesi at 13:55 for a stoppage in play. Canada head coach Laura Schuler giving Potomak, Spooner, and Irwin a talking-to as they come off. Finally, we see some vintage Hilary Knight using her speed and big frame to set up a play! A good save by Szabados keeps Team USA off the board. Poulin is stoned on the one-timer by Rooney at 11:35, and Canada can't sweep home the rebound! Rooney will freeze the puck at 11:34 after a monster save! Good pressure by the Americans before Szabados finally smothers the puck at 10:27. Knight with a nice drop-pass to Decker, but she's a foot over top of the net with her one-timer at 8:55. Shannon Szabados' glove is looking world-class on that save off Marvin at 8:30. Agosta to Poulin just goes wide on the one-timer at 7:48. Duggan feeds Pannek in the slot, and she rips it off the post past Szabados! Good cycle game by the Americans had a tired Canadian line pinned, and HILARY KNIGHT converts off the Coyne pass at 5:58! GAME TIED AT 1-1! Icing called on Team USA at 4:21. Rooney smothers a puck sent towards her by Wakefield at 3:29. Poulin hauls down Duggan, and that's a hook at 1:56. US power-play! Amanda Kessel trips Rebecca Johsnton, so we're back to 4-on-4 at 1:38! A couple of late chances for the Canadians, but the horn sounds and we'll go to the intermission! I need a beverage, so I'm taking a break over this intermission. Talk amongst yourselves! Made it back with a local craft adult beverage, and I must say that craft adult beverages are so much better than the big producers. I spent part of yesterday making irish cream from a recipe to which good friend Paul Lukas introduced me. I'll probably end up posting that recipe this week because it's so much better than buying that garbage that Baileys tries to peddle as "irish cream". Many thanks to Paul for that recipe! Jets beat the Blues 4-0. Goals from Lowry, Laine, Scheifele, and Morrissey. Good response after the 2-0 loss last night. Manitoba Moose won all three games in the last three days to move into first-overall in the AHL by three points over the Marlies. Moose have 45 points, and a pair of games against the Rampage prior to the Christmas break! Moose outscored Belleville and Toronto in the three games by a combined 14-5! Cameranesi may have saved a goal by hooking down Agosta, but she'll have to sit for two or less at 19:06 of the third period! Kelly Pannek was dumped by Spooner at 16:28, and the Americans will get a power-play! Blayre Turnbull with a good chance on the penalty kill, but Rooney is equal to the task. Mad scramble around the Canadian net at 15:13, but no goals come of it! The Canadian penalty expires seconds before the US goes offside at 14:25. Spooner gets a great chance in front, but Rooney holds her ground to keep this game tied at 13:42! A pass intercepted and Saulnier fed Johnston, but Rooney denied that chance at 12:06! Americans ice the puck after some good pressure by Canada at 11:18. A tired American line stays on. Chance for Canada? Team USA relieves the pressure and gets that line off the ice. Cameranesi fired a puck way high at 9:51, but the Americans have good pressure right now. How many times have the officials been in the way of a play tonight? C'mon, stripes. You're better than this. Americans are called for offside at 8:24. Szabados has to be sharp on a redirected pass, but she keeps the puck in front of her at 7:04. 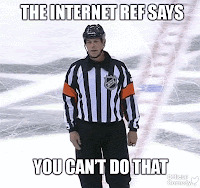 The puck gets pinned under Blayre Turnbull, but the referee calls her for covering the puck at 6:32. US power-play! Szabados made solid saves on both Cameranesi and Keller in front at 5:42! Canada kills off the penalty! Americans seem to be building momentum here. Jenner and Saulnier can't get the 2-on-1 to work! Agosta barrels over the referee after Szabados stones Stecklein on the doorstep! Final minute of the third period! Furious pressure from the Americans in the last 30 seconds, but we'll go to overtime! Brianne Jenner scored in overtime earlier in this series. Will we see more heroics from her? Kessel with the first good shot over overtime at 4:03. Brandt with a good shot turned aside by Szabados at 3:43. Szabados freezes the puck that rolls in on her at 2:31. Fortino with a great toe-drag, but is denied by Rooney at 2:02. Saulnier and Turnbull with chances, but Rooney says no. Rebecca Johnston is stopped by Rooney at 1:07. Spooner throws the puck to the net and the puck is stopped by Rooney. The puck, however, is lying in the crease and JENNIFER WAKEFIELD barrels into the crease, pushing the puck across the line at the 27.4 mark! CANADA WINS 2-1! Hold on! USA head coach Robb Stauber is challenging for goalie interference. The referees confer. CANADA DOES INDEED WIN 2-1! WOW. If you missed this one, you missed a great game. Neither team gave an inch, and this only makes me want the Olympics to arrive much sooner to see this great rivalry come to life once more! Canada and the US put on a heckuva show in the last six games. There is nothing lost in this rivalry in having this six-game series, and it may actually have heightened the animosity between these two teams. If I'm Canada, I'm worried that the Americans may have been playing possum in this series as it seemed like that Hilary Knight line wasn't itself over the six games. If I'm Team USA, I'm worried that Canada has figured out the American system in taking five of six games. In either case, we'll see what happens in February between these two teams when Olympic gold is on the line! The image to the left was put together by the St. Louis Blues in February 2016 when they owned the rights of both of the men in question. Those men are Pheonix Copley and Jordan Binnington, and only one of them still toils for the Blues. Copley was traded at last year's trade deadline with Kevin Shattenkirk to the Washington Capitals, and his rights are still owned by the Capitals for this current season. 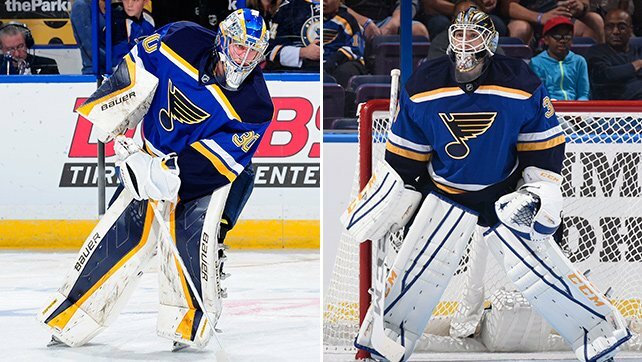 Not to make it too confusing, but Binnington is still a member of the Blues while Copley is still a member of the Capitals. Clear? Moving on. Well, in reality, neither are in the NHL currently as they're both with AHL clubs. Pheonix Copley is with Washington's affiliate in the Hershey Bears. The Blues, though, don't have an official AHL affiliate for the 2017-18 season, so they've been placing players with AHL teams who have a need for players at specific positions with an emphasis on Chicago, their former affiliate who is now affiliated with the Vegas Golden Knights. 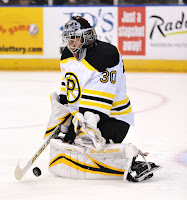 With the Knights having their netminding injuries clearing up over the past couple of weeks, Jordan Binnington was instead assigned to the Providence Bruins recently as they had a need for a netminder. Clear? Ok, let's continue. Tonight, the Providence Bruins visited the Hershey Bears, and these two former goaltending teammates got to square off against one another as the starters for their respective teams. The Bruins jumped out to a dominating lead, and early in the second period Hershey's Garrett Mitchell hammered scorer Kenny Agostino into the boards, setting off the fireworks between these two teams. Instead of standing 200-feet apart, Copley and Binnington decided to renew acquaintances at center ice! I'm pretty sure that the AHL officials should have just handed out two minutes each for hugging, but a goalie fight is something we just don't see enough! As the announcer stated, Copley probably needed to take some frustration out after allowing four goals in 27 minutes of play, but I'm not sure Binnington was the guy he should be blaming. Off-setting penalties to both netminders was the result as each goalie got a minor, a major, and a misconduct for their parts in the fight at the Providence blue line. Both men would see their nights end at that point as well as Providence put Zach McIntyre in for the remainder of the game in place of Binnington while Hershey replaced Copley with Vitek Vanacek. Perhaps the weirdest part of this game is that after the second period in which there were 77 minutes in penalties handed out, there were no penalties given in the third period. The final score was 6-2 in favour of Providence, so Binnington still earned the win and Copley still received the loss. If Copley was looking for a win on the night by picking the fight with his former Blues teammate, I'm not sure I'd award him a win in the scrap either. At best, it was a draw, but at least we got to see the goalies go toe-to-toe in what looked like a rather pedestrian AHL blowout. There's no denying that I am a U SPORTS fan when it comes to hockey. Yes, there are other incredible sports to watch within U SPORTS - football, basketball, field hockey, rugby, and more - but I have had the privilege for the last number of years to watch U SPORTS men's and women's hockey up-close and in-person. It shocks me how this is a segment of the hockey world that has gone unnoticed for so long when such esteemed players like Mike Ridley, Derek Ryan, Stu Grimson, and Jared Aulin have all played hockey at the U SPORTS level. Granted, there aren't the McDavids and Crosbys at the U SPORTS level yet, but U SPORTS is producing some incredible talent, and we witnessed something happen this week that has never happened before when it comes to the talent at the U SPORTS level. For the first time since the Canadian World Junior hopefuls began squaring off against the U SPORTS all-star squad in 2015, this year was the first to see the U SPORTS all-stars sweep the two-game series against Canada's best junior players. It also marked the first time any U SPORTS team has won more than one game against Hockey Canada since 1988. Some may point to this as an anomaly in the history of the U SPORTS-Hockey Canada annual December showdown, but it might be time to start giving U SPORTS its due credit for attracting some great talent to the university circuit. While the U SPORTS all-stars did name two goalies to the roster, it was a pair of Hockey Canada hopefuls who pitched a shutout on Wednesday night, backstopping the U SPORTS squad to a 3-0 victory. Because Hockey Canada brought four goaltenders to camp, the U SPORTS team agreed to have two of the Hockey Canada goalies tend the nets for them in both games in order to help Hockey Canada evaluate its players. Colton Point and Carter Hart stopped all 32 shots they faced on Wednesday in blanking Canada with Point stopping 14 shots in his 30 minutes of work while Hart made 18 saves. While the Canadian offence was silenced by the two netminders, the U SPORTS team saw Luke Philp (Alberta) score on Michael DiPietro 2:44 into the game on a power-play. Michael Clarke (St. Francis-Xavier) and Logan McVeigh (Saskatchewan) added empty-netters late to pace the U SPORTS all-stars to the 3-0 win. 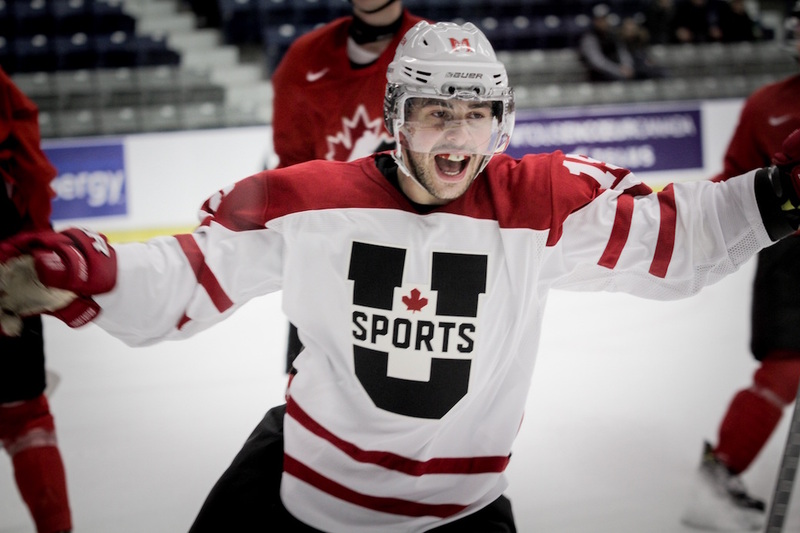 Make no mistake, though, as the U SPORTS team skated with the Canadian juniors for the entire game, giving no less that they took from players who are competing for a spot on the Canadian World Junior squad. Some will point to the fact that Canada sat OHL leading scorer Jordan Kyrou, 2017 WHL player of the year Sam Steel, Robert Thomas, Alex Formenton, Kale Clague, Conor Timmins, Victor Mete, Dillon Dube, and Dante Fabbro as a weaker-than-normal Canadian squad, but let's not forget that the U SPORTS all-stars are players who haven't been top picks at the NHL draft nor have been enough of offensive dynamos for NHL teams to come calling. Whatever the case, a lot of people kind of shrugged off the win on Wednesday due to the fact that the U SPORTS team had two outstanding junior goalies playing for them, only scored a special teams goal, the U SPORTS team being older and more physically mature, and didn't get the full Canadian junior squad's best players. It'll be a different story tomorrow, they said, when the junior squad ices a better team. Thursday night saw the U SPORTS team prevail a second time with a 4-3 win over the Canadian squad. There were a few chances for both sides, but the two teams made good on what they could muster as the Canadians out shot the U SPORTS team 27-23 at the end of the game. Alberta's Jason Fram scored with 6.5 seconds remaining in the game off a rebound while on the power-play to give the university squad the victory. Golden Bears teammate Cole Sanford had a pair of goals in the win while former Niagara IceDog Stephen Harper, currently playing at Acadia Univeristy, returned to the arena where he played junior and scored the second goal for U SPORTS. Alex Formenton, Robert Thomas, and Kale Clague responded for Canada. The two netminders from the previous night - Hart and Point - backstopped Canada on Thursday while Harvey Samuel and DiPietro joined the U SPORTS team. Samuel stopped 13 of 15 shots in his 30 minutes of work while DiPietro picked up the win as he stopped 11 of 12 shots. Hart stopped 7 of 9 shots in his half-game while Colton Point took the loss in stopping 16 of 18 shots, including surrendering the late goal to Fram. Both Dube and Fabbro sat again in nursing injuries while Jake Bean, Cale Makar, Michael McLeod, Tyler Steenbergen, Taylor Raddysh, Brett Howden, and Boris Katchouk all took seats for this game as Canada evaluates its talent. A Spengler Cup goalie (Jordon Cooke - Saskatchewan). A defenceman with AHL and ECHL experience (Fram - Alberta). An Atlanta Thrasher draft pick (Kendal McFaull - Saskatchewan). A winger with ECHL experience (Sanford - Alberta). You can't say that the U SPORTS team simply was better when it comes to their hockey experience. McFaull was a sixth-round pick of the Thrashers whereas the Canadian junior squad has multiple first- and second-round picks on its roster. Instead, the difference is that the players at the U SPORTS level have more experience as most are between 20 and 24 years of age. They're playing against more physically mature players, making it more akin to the ECHL than to junior hockey. What makes U SPORTS unique is that players who may have filled a role on their junior teams as assigned by the coaching staff may be filling a new role in U SPORTS hockey. Josh Roach and Luke Philp, for example, both played against the Canadian juniors and are first- and second-leading scorers, respectively, in Canada West while Logan McVeigh is fourth-overall in scoring. Here's where things change: Josh Roach never even played major junior hockey. He suited up for the Humboldt Broncos and the Flin Flon Bombers in the SJHL before enrolling at the University of Saskatchewan. He leads the Canada West Conference in scoring, yet never once led his SJHL teams in scoring. He was a point-per-game player with the Bombers in his final SJHL campaign, but he twice has exceeded that rate of scoring with the Huskies including this season where he's already tied his career-high in points. As we've seen with junior players, often their roles and their physical maturity dictate their effectiveness at that level. Roach has found his game at the U SPORTS level, and the Huskies are reaping the rewards. The top-ranked Alberta Golden Bears, in terms of having a better-than-junior team, have players with 20 games of AHL experience, 136 games of ECHL experience, and one NHL sixth-round pick on their current roster. No one is saying that they'd compete as an ECHL team, but that kind of experience is why the Golden Bears find themselves at the top of the national rankings year after year. As further examples, third-ranked Saskatchewan, who is often a favorite for a national championship, currently boasts a lineup with two games of AHL experience, 17 games of ECHL experience, and three NHL draft picks in McFaull, Sam Ruopp (Columbus), and Jordan Fransoo (Ottawa). The second-ranked UNB Varsity Reds' roster boasts 35 games of AHL experience, 48 games of ECHL experience, and three NHL draft picks in Olivier Leblanc (Columbus), Colin Suellentrop (Philadelphia), and Christopher Clapperton (Florida). Again, no one is saying that these three teams could hop into an ECHL season and beat any of those teams, but there is enough talent in U SPORTS hockey that no one should be surprised that they can defeat Canada's best junior players. I guess what it comes down to for most of these teams is that they aren't marketed as an exciting and entertaining alternative to the overpriced NHL or some not-so-strong junior clubs. The 14-17-2-1 Saskatoon Blades share a market with the 13-2-1 Saskatchewan Huskies. Which team would you rather see when just viewing their records? The Huskies are virtually a lock for the Canada West playoffs while the Blades are battling for, at best, a wild card spot where they'll mostly be bounced in the opening round based on how the WHL is playing out. If you're a fan, why wouldn't you drop in and see the third-best team in the nation who is putting together another incredible season? The Alberta Golden Bears get decent crowds, but based on how the WHL's Edmonton Oil Kings are doing - brutal, by the way - you'd assume they'd sell out Clare Drake Arena for every game. That's not so, however, as the 7-22-3-1 Oil Kings are still a draw over the top-ranked 15-1-0 Golden Bears. The Golden Bears might be the best hockey in Edmonton for the money, and that includes the Oilers and their tire fire of a season. The Golden Bears, despite being Canada's best university team, average 1043 fans per game. 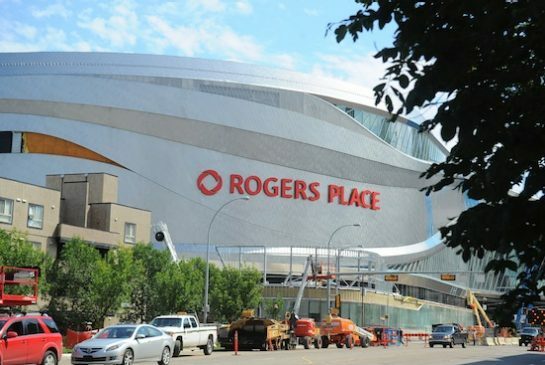 If the Oilers were 15-1-0 on the season, there wouldn't be a seat available at Rogers Place regardless of ticket cost. Cost to see the virtually unbeatable Golden Bears? $16 per ticket. Yeah, you do the math. I guess what I'm saying is that U SPORTS deserves more credit than what the current mainstream sports media spends on it, and it's up to you, readers, to get out to your local universities and check out the action. This isn't just a call for U SPORTS teams either. 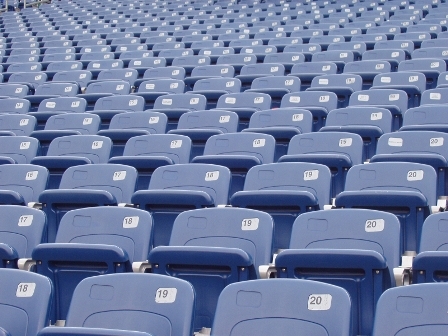 NCAA teams can certainly use your support as well, and it's not going to cost you an arm or a leg. The action is incredible, the atmosphere is fun, and the hockey is excellent. But why don't you find out for yourself? Games resume in January, and the action will certainly be even more heated as the races for conference playoff spots and berths to the national championships are on the line. While the NHL and the AHL are grinding through the winter months of January and February, there will be teams whose seasons will be on the line prior to the NHL's trade deadline, and that's why you should be going to see your local university and collegiate teams. I guarantee that you'll see some incredible hockey for pennies on the dollar when compared to what is spent at NHL arenas. Support local hockey. It's just as good or better than junior hockey, and it's far less expensive compared to some of the horrid hockey being played in NHL rinks. You're going to find some outstanding hockey hiding in those rinks, so get out there and catch all the action!